Welcome to the page of the Nederlandse Kring van Fuchsiavrienden. 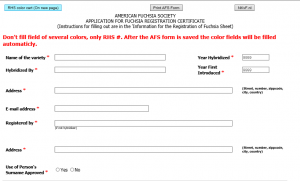 On this page you will find all the information to fill out the AFS-form. 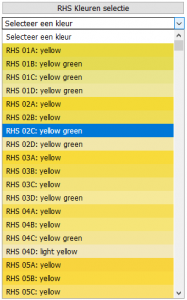 Just click on the image to download or go to the RHS Colour chart or the AFS form. With care we made an AFS form in which all fields can be filled out by the rules of the AFS. If a field is NOT filled out by the rules of the AFS you will get another page to rectify this. After rectifying, the form will save this rectification and returns to the (filling out) page. After all fields are filled out correctly you will see the final page in which it is still possible to rectify the AFS form for the last time. On this (last) page it is possible to upload the picture(s) of the plant. Note: ALL DIMENSIONS are in mm (use ONLY digit). After the (last) save it is impossible to rectify the AFS form without sending an e-mail to afs@nkvf.nl. As stated below the list of rules we use. Twisted If twisted = Yes you have to fill out Described. PETALOIDS: (if any) If known, ALL fields must be filled out, except colors. (see image) If Seed Parent and Pollen Parent are known, Mutation or Sport of must be empty. If Mutation or Sport of is filled out Seed Parent and Pollen Parent must be empty. 'Found' Seedling of Unknown Parentage If Seed Parent and Pollen Parent are known, 'Found' Seedling of Unknown Parentage must be NO. If filled out = Yes, all fields will be cleared after save. WILL MAKE GOOD: You must fill out at least 1 option. PREFERRED EXPOSURE You must fill out at least 1 option.